Today we wanted to show some of the great content that we had at BriForum last month. In this video, Thomas Kötzing of www. Today we wanted to show some of the great content that we had at BriForum last month. 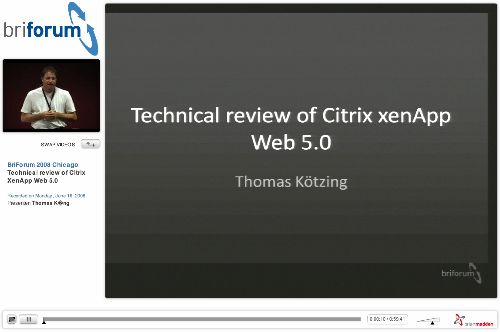 In this video, Thomas Kötzing of www.ThomasKoetzing.de discusses XenApp Web 5.0, otherwise known as Web Interface 5.0 in a session titled "Technical Review of Citrix XenApp Web 5.0." In this session, Thomas will talk about and show you the new features of XenApp Web 5.0. To view the presentation, click on the screen shot below. The associated PowerPoint can be downloaded here. While you're checking out the video, take a look at the new screen swapping feature (the arrows under the head video) and the full screen feature (icon in the lower left corner). Is it me or does the video have no sound? If you had bothered to actually play the presenation you would have seen that the demo is in it. And the users love it! It looks so much better and it has almost all the options that users were screaming for in the prvious versions. From an administration point of view - not much has changed, but the new addtions (such as pre log on message - which is great when you want warn all users about a scheduled outgae for example) are be useful. Love it! Desfinitly a step in the right direction. The video in the big screen on the right (by default unless you used the screen swap feature, then it'd be in the upper left corner) is the feed directly out of Thomas' laptop. In fact, every BriForum video since 2006 is a direct capture of the presenter's laptop, except in situations like panel discussions that don't have a visual presentation. If it has to constantly re-buffer for you, that's definitely related to bandwidth. I've watched these videos from all over the world, even on my verizon card, without problems. The only time I've run into continuous need to re-buffer is when I don't have enough bandwidth to keep up. That said, we only buffer out ten seconds and then pause. But I like your idea... kind of like YouTube, where you could pause the video and wait awhile for it to buffer way out in front. I don't know if that's technically feasible with the setup we've got, but I'll talk to our flash developer about it. how is the new interface going to work when you have a Citrix Access Gateway with Logon Points ???? if they cannot extend the new look and feel including the logon then i might have to go back to Secure Gateway and Web Interface. I have also problems to view this video because it's buffering every 10 seconds. Bandwidth should not be the problem (10/10Mbits). Could it be the latence, I'm trying to watch this video in Finland?